Let’s face it, coffee might as well be another of humanities basic necessities, arguably up there with oxygen and sleep. All of us can probably agree on the countless hours of wakefulness and productivity that humans would’ve missed out on if coffee hadn’t been invented. But, what happens when sleepiness and tiredness begin taking over and coffee is nowhere in sight. Here is where Alert Gum, a new caffeine gum product, comes into play. If you step back for a minute, humans have been chewing gum for thousands of years. Even now in 2018, demand for gum hasn’t dwindled a bit. 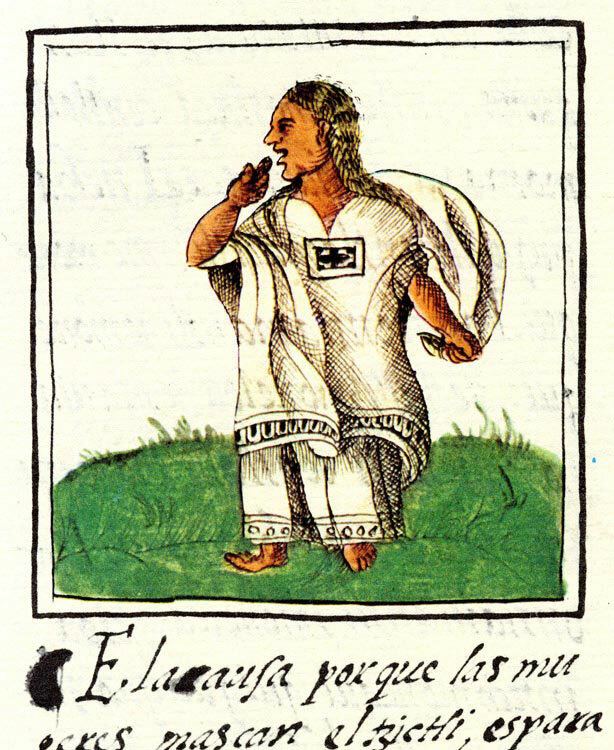 Ancient portrait of an Aztec chewing gum back in the day. In fact, quite the opposite. Companies are introducing all kinds of additives and flavors into gum to add more value to the experience of chewing gum. Many exotic bubble gum flavors are now available for purchase with even more in development. As bizarre as it may seem, the list of gum flavors now include bacon, thanksgiving, and even eggnog. Yummy…? One of the newer additions to the gum market is Mars Wrigley’s Alert Caffeine Gum. Though not as esoteric as some of the aforementioned gums, it’s pretty special due to the fact that it’s the only caffeinated gum manufactured by a major foods company. Specifically, Alert Gum comes from the 5-Star division of Mars Wrigley. In this post, I’ll give you my honest personal review of Alert Caffeine Gum and dive deep into what you can expect from trying out the gum. But first, check out my video review of Alert Gum below for a quick summary of the article. I define effectiveness as how well this product accomplishes the purpose that most people buy it for. Being a caffeine-containing gum, it’s safe to say most people will buy Alert Gum to get a quick boost of energy and to help them stay awake, energized, and focused. Alert Gum seriously delivers in this respect. Each piece of gum has 40 mg of caffeine, which is about half as much as you’d find in an 8 oz cup of coffee. Considering the gum is smaller in diameter than a quarter, this is a pretty hefty amount of caffeine for a single piece of gum. If you want a full cups-worth of caffeine, just pop in two pieces of gum and you’re set. Aside from the caffeine, chewing mint gum has been scientifically shown to greatly decrease sleepiness. It has also been shown to provide a short-term boost to concentration, reaction time, and even memory. As a result, if your goal is to fight sleepiness like the plague that it can be, mint Alert Gum can be a better option than coffee for staying awake and productive. If you’re like me and tend to struggle with avoiding drowsiness while driving, pop one in when you enter the car. By the time you’d normally feel sleepy, the caffeine will have kicked in and you’ll be on your way for a smooth ride. The caffeine from Alert Gum enters the body through the same mechanism as coffee. As a result, it takes about the same time for the caffeine to kick in. From personal experience, I generally start feeling a bit more awake after about 15 minutes of popping a piece of gum in. After about 35 to 45 minutes, I really start feeling the caffeine kick in. This is consistent with research on caffeine metabolism, which commonly reports a max caffeine blood concentration after about 45 minutes of consuming it. This time lag can be a bit of an inconvenience considering that often times when we’re sleepy, we need a fix asap. Good news is that chewing a piece of mint gum, even if it has no caffeine, usually helps you feel more awake and energized for a while. So even though the caffeine might not have kicked in yet, you can usually ride out the additional wakefulness that comes from chewing mint gum while you wait for your body to absorb the caffeine. Many people would agree that flavor is the litmus test of gum. At the end of the day, chewing gum is so common because it’s an enjoyable passive experience. It’s hard to imagine a universe where people enjoy chewing bad tasting gum, right? While I do agree that this is the case in most situations, I also believe that Alert Gum’s purpose is a lot more practical in nature. As a result, as long as the gum keeps me from falling asleep, I’ll happily compromise and sacrifice some good flavor. The very first piece of Alert Gum I ever tried was mint flavored. I was expecting, naively, for the taste of the caffeine to be completely absent from the flavor of the gum. I popped the gum in and was pretty astounded when I tasted how bitter the gum was. I could definitely pick up on hints of mint, but the bitterness almost over overpowered it. Chemically, this makes sense. Caffeine is a base, which makes it taste bitter. This is also one of the big reasons why coffee has a very distinct bitter flavor. Perhaps the best way to describe the taste of Alert Mint Gum is to take a piece of Wrigley’s Wintergreen gum and sprinkle some Goody’s Headache Powder over it. On the bright side, this bitter taste lasts less than 2 minutes. After that time, the mint taste takes over and your mouth get’s accustomed to the flavor. In a way, the not-so-desirable taste can be a blessing. I personally find that the bitter taste is like a slap to my taste buds that actually helps me stay awake. From chewing this gum semi-regularly, I can also say that after you’re done with the first pack of gum, you become much more tolerant to the bitter taste. I’m currently at the point where the flavor doesn’t faze me nearly as much as it initially did. the gum starts sticking to your teeth, leaving you feeling like your chewing water. Too tough and it feels like you’re chewing on rubber. Alert Gum get’s full marks in the texture category. The gum comes in a hard hexagonal shell. As you proceed to chew the gum, it settles into a great consistency. This is a big plus, especially considering that many popular gums in the market still can’t get the whole texture thing right. Stride gained immense popularity a few years back for regularly claiming that it was the longest lasting gum on the market. Whether that claim was true or not, one thing’s for sure, how long the flavor of the gum lasts is pretty important for a lot of gum chewers out there. After you’ve been chewing Alert Caffeine Gum for a few minutes, the bitter taste begins to subside. The flavor begins to improve, and what you’re left with is the minty flavor that lasts a surprisingly long time. From my own tests, this mint flavor lasts about an hour. However, unlike other products, the gum doesn’t really taste horrible after the hour is up. It’s more like the flavor becomes less enjoyable and basically flatlines at that level. It retains its minty taste for far longer than it does its bitter flavor. Which is great news, I don’t think I could bear hours of the caffeine taste. The texture of the gum is retained for just as long, if not longer than it’s flavor. In fact, I haven’t had the experience of the consistency of the gum falling apart despite chewing it for very long times. This is something I can’t say about some of the other popular gums in the market. Alert Gum does exactly what it was created to do: give you a nice jolt of energy to go about your day. The effectiveness of the gum is compounded when we consider the proven benefits to wakefulness, energy and mental performance that gum provides by itself. The texture of the gum is at the right level, it’s neither too tough or gooey. It’s elastic enough to blow bubbles with, but not sticky to where you can expect jaw pain after chewing it for a while. The gum flavor and texture lasts for a long time, so you don’t have to worry about popping in a new piece of gum to preserve the flavor. The only area where the gum slightly disappointed me was the flavor. The gum is pretty bitter, especially the first time you ever try it. From other people’s experiences with Alert Gum, the consensus is that they’re initially quite surprised by the flavor. That being said, I don’t consider the poor flavor a deal breaker. Seeing as how the caffeine in the gum really helps you stay awake, I don’t mind sacrificing some in the flavor category. Besides, some may find that the bitterness can help them wake up in the same way that, say, a sour warhead can. Aside from this, Alert Gum has a been a great addition to the gum market for me. Ever since I first saw it at the gas station near my apartment, I always keep a pack in my car’s passenger seat. Whenever I’ll be driving at night or long distances, I pop one in and it get’s the job done. I also keep it in the office and chew on a piece whenever I’m getting ready for long or boring meetings. Thanks for checking out the review, I’m hoping it’s been helpful. 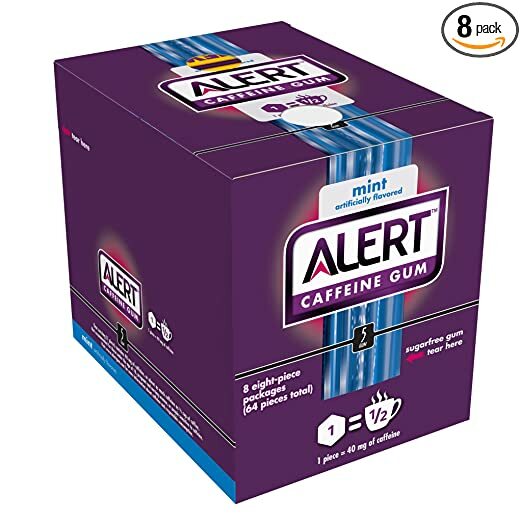 If you’ve tried Alert Gum and would like to contribute to the post in any way, please leave a comment below and I’ll respond to it as soon as possible. Thanks for the confirmation, after my own 1st usage of the Alert gum. I find preference for it, instead of a lot of fluids w/ caffeine. ! Glad you enjoyed the review! I personally love my coffee, but there are many times when I don’t feel like drinking any fluids or eating anything just to get some caffeine in my system. The caffeine gum is really convenient in these cases.